Cigna Plan G Medicare Supplement will be issuing a rate decrease in several states on May 1 of 2016. Plan G has become a top selling Medigap policy in recent years. Plan G is very similar to Plan F, but Plan G has a $166 Part B deductible. The deductible is a calendar year deductible so only paid once a year. With the rising cost of Medicare Part B to $122 a month, many Americans are looking for ways to save money on their Medicare Supplement. At this time only select states will see the premium reduction for Plan G. Other states may be subject to lower rates later this year. Starting May 2016 the following states will see the reduction listed below. The rate decreases only apply to preferred and standard rate classes. Check on Plan G Rates In Your Area. 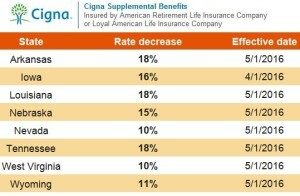 Cigna Medicare Supplement Plan G cost can vary from state to state and region to region. Some areas like Nevada, Pennsylvania, and Virginia it is already a fast selling plan. To check the new rates simply get a quote through this site. Also, in some states Cigna offer discounts to couples who enroll together. This added benefit can be explained through a Medicare insurance agent. Cigna Medicare agents can review the plan details with you and answer questions you may have on your transition to Cigna. If you currently have a supplemental policy, you may be able to switch to Cigna Medicare provided you meet the underwriting criteria. If you currently have a medicare advantage plan you would have to keep your advantage plan through the end of the year. However, at the end of the year you would be able to leave your Medicare advantage plan and get a Cigna Supplemental plan provided you meet the underwriting criteria. Lastly, if you are new to Medicare, and have both Medicare Parts A and B, you most likely can enroll in Cigna coverage without underwriting. Through this site you can contact us and speak with a live licensed agent who can inform you of not only Cigna’s plans but also numerous other companies that may offer even more affordable plans in your area. Cigna News is another place where you can learn about Cigna’s growth in the healthcare industry and receive information on its merger with Anthem Blue Cross Blue Shield. Aetna is ranked one of the country’s top insurance companies in the US. Aetna supplemental health insurance plans offer customers a variety of benefits, including Medicare Supplement Plan F, Plan G, and Plan N. These three Medicare Plans are some of the best selling plans in the country. Aetna is especially committed to providing our nation’s Medicare recipients with complete and first-rate coverage, so members can achieve optimal health and receive care from all Medicare doctors and facilities across the country. Because of the increasing out-of-pocket expenses associated with Medicare, Medigap, which is a Medicare Supplement insurance, has become a crucial component of health care coverage for the Medicare eligible population. In most states, Aetna provides this service to adults 65 years and older. Depending on plan selection. The coverage can conveniently eliminate or reduce deductibles, copay’s and coinsurance, which have risen over the past few years. 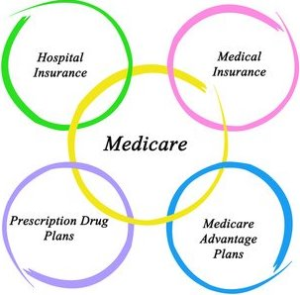 We have other pages on this website where consumers can find a comprehensive guide detailing exactly what a Medicare Supplement policy is, what it covers and how to purchase Medicare Supplement insurance. Hot Tip: Aetna Supplemental Plans are one of the fastest growing segments of Aetna Insurance Company. Aside from supplemental coverage, Aetna also offers its customers an array of complementary products with a personalized customer service approach. Dealing with the death of loved one is difficult. Aetna’s Final Expense Insurance allows a family to grieve the loss of a loved one, rather than focusing on funeral costs. This coverage provides many levels of life insurance coverage for all funeral associated expenses, and rates do not increase throughout the life of the policy. These policies have a simplified underwriting and often can be approved very quickly. Heart attacks and cancer are the first and second leading causes of death in The United States. A stroke can happen to a healthy individual at any age. It is crucial, therefore, to protect oneself from these relevant diseases. This coverage is important because it protects the consumer’s financial assets if he/she were to acquire one of these diseases. Hospital Indemnity Insurance offers a variety of benefits for anyone who may be admitted and/or confined to a hospital for any reason. It would cover any additional expenses as a result of the hospital stay, and benefits are paid directly to the insured. Recovery Care Insurance is available for customers aged 50 to 89. This provides monies that can be applied to any nursing home residence or assisted living facility expenditures. If you are interest in Aetna supplemental health insurance plans, please request a quote. Aetna also offers another important product for consumers who may be in need of care at their home. Ranging from physical therapy to a qualified health aide, this policy provides any service a client may need while remaining in the comfort of their home. Learn more about Aetna today. Medicare insurance plans from QuoteFinder.Org are not offered by any Medicare Supplement Agent. We pride ourselves on only working with Authorized to Offer agents. This type of independent agent is required to be certified by all Medicare insurance companies. This level of certification allows for the consumer to work with one agent and all companies. The consumer can work with one agent and that single agent can answer all questions. This level of customer support is rare to find in our country. Best of all our services are free as we are paid through the insurance companies. All rates are set by law, so the rates you see are the lowest possible rates. An Authorized to Offer agent can provide personalized service and assist you in finding solutions to fit your Medicare needs. This site gives consumers access to a REAL person to discuss questions and concerns. 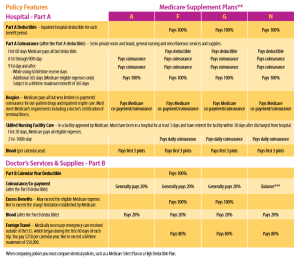 Obtaining the correct Medicare supplement plan is very important. Agents are trained to help you understand how specific plans may address your unique needs. If everyone works together and both parties listen carefully and asks questions, everyone will wins. A true Medicare Supplement Agent will be your guide for years to come. Many of our agents are now on a second generation of clients. We have many 90+ year old clients who still come to us when they have questions. Contact us if you are looking for a FREE Medicare supplement agent.